Things have been very busy in our household, not entirely in a good way. My mother (who appears with me on the masthead of this blog) passed away just after a week ago, followed by the cat. Both were very old, and both died very peacefully. Nevertheless, the house is startlingly quiet, and I have a bit too much to do. Consequently I am DEFINITELY in the mood for a little Christmas cheer … and this recipe fits the bill. I love cranberries. The idea for making ice cream with them came to me in a dream. I need more dreams like this one! My family tried the recipe over Thanksgiving, not on Thanksgiving Day (because my relatives are fixated on pie on Thanksgiving) but later in the weekend. 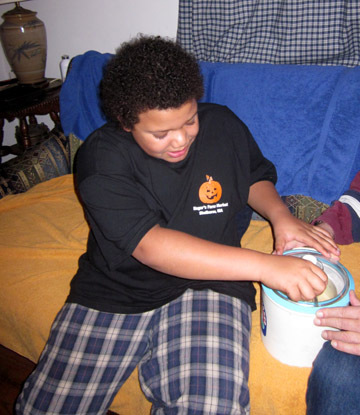 My nephew Michael was not at all sure he really wanted to churn ice cream, but we had no choice. My electric ice-cream maker was missing a critical part so we got out the old hand cranker. It took a while … but even Michael decided that the result was more than worthwhile. I do not exaggerate when I say that moans filled the room as we ate. In fact, this is one of the last treats my mother enjoyed. Feel free to experiment with the recipe. I almost added a little orange rind to the mixture. I’m not sure the ice cream could taste any better than it did, however. First, make your ice-cream base. Heat the milk until it is steamy but not boiling. In a separate bowl, whisk together the egg yolks and sugar until the mixture is thick and light yellow (about 4 minutes). Remove the custard from the heat, and strain it into a heatproof bowl or pot. Cool thoroughly. Remove the sauce from the heat, and push it through a stainless-steel strainer. You’ll end up with about 1-1/2 cups of sauce and a small amount of solid matter; you may discard the latter. Cool the sauce, covered, at room temperature; then refrigerate it until you are ready to make the ice cream. When that time comes, use a mixer or whisk to break up the jellied cranberry sauce into a thick liquid (instead of a solid). Measure out 1 cup. 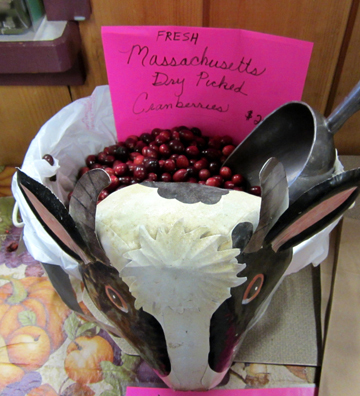 You may reserve the rest to put on top of your ice cream if you want extra cranberry flavor. Go back to your ice-cream base and whisk in the cream, vanilla, and salt. 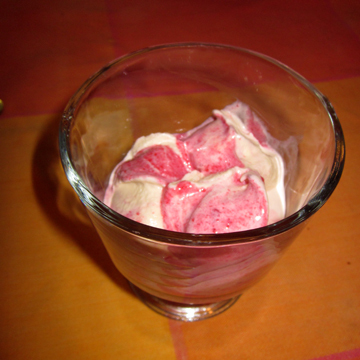 Place this mixture in your ice-cream freezer and begin the churning process. When the ice cream looks about ready, add the cup of cranberry sauce and continue churning just until you have a pleasing swirled effect. Serve immediately. By the way, if you find yourself in need of my Pudding Hollow Cookbook to give as a Christmas gift (or to use yourself over Christmas), never fear: copies are DEFINITELY available. If you order by Wednesday noon and live in the continental U.S., the book should arrive by December 24. To order, click here. This entry was posted on Tuesday, December 20th, 2011 at 4:00 am	and is filed under Cranberries, Holiday Foods, Ice Cream and Dessert Sauces. You can follow any responses to this entry through the RSS 2.0 feed. You can leave a response, or trackback from your own site. I’m sorry about your mother (and your cat). Best wishes for a Merry Christmas and all the best for 2012. I am so sorry for your loss. It is very hard at this time of year. I enjoy your blog and think I will make the cranberry key lime squares again, they are wonderful! sounds like I need to put the ice cream maker insert in the freezer! Keep well, Tinky. It gets a bit easier. I apologize for getting your name wrong. Don’t know where I got the Kiki. A senior moment which are getting all too many. Oh Tinky, I’m so sorry to hear about your losses. I do hope that you get some of that Christmas cheer you’ve been looking for. You deserve it. P.S. Your ice cream sounds divine. Adelaide–Sorry to have taken so long to respond; I was computerless for a little bit! Thanks so much for the good wishes. I hope your Christmas was lovely, too–and I LIKE the name Kiki! I also really like your Christmas poem. It truly captures that special feeling. John, thanks for reading and for the kind thoughts. Thanks, tut-tut. I know it things are improving! Thanks, EveryDay. I got LOTS of Christmas cheer; I hope you did, too! Sending you some hugs and best wishes for the New Year Tinky…. The same to you, Veronica!